Brooklyn-based band Kill Henry Sugar cite many influences. Some are to be expected from a minimalist folk duo: Hank Williams, Johnny Cash, Joan Baez — the latter of whom the band backed up this past summer in Europe. But others, such as George Gershwin, are a bit less obvious. As lead singer and guitarist Erik Della Penna once explained to Knoxville’s Daily Times, being from New York, he used to be “ashamed” to say he liked a Gershwin tune once in a while. Don’t be ashamed, Erik! Everyone loves a little “Crazy For You” now and then. Often, the sound here feels a bit too reminiscent of pretty, plucky contemporaries Nickel Creek — but without the production values. Having recorded this album in Della Penna’s grandmother’s Bronx basement, the band was certainly aiming for the minimalist vibe. But occasionally this approach seems to work against the songs. Too often on Swing Back, pieces are folded in so many times that they get lost within themselves. When the guitars pick up, Dean Sharenow’s drums should, too. Della Penna’s pitch-perfect voice should soar in certain places, yet often stays neutral, almost apathetic. The tracks either plod along following the same routine, or they can’t really decide where they want to go. For example, “At the Mall” kind of sounds like an early ’90s grunge song given a rootsy makeover by a singer with superb diction. With certain tracks, though, the duo succeeds admirably. On “Tammany Hall,” Della Penna pleads, all Johnny Cash-like over vengeful minor chords, “I got burned so I burned it down, but they’re just gonna put it up again.” On the poppy, breezy, harmony-heavy “Neighbors,” Della Penna gives a friendly high five to his ol’ buddy, George. Certainly, Kill Henry Sugar deserve credit for attempting to eschew their affinity for genre-bending, garage-rock indie “oddballity.” And the music is pleasant and well played. But if they’re ever going to rise above what’s already been done, the band should get out of grandma’s basement, just to see what it’s like. 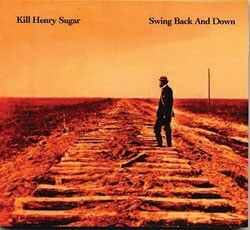 Catch Kill Henry Sugar at The Middle Earth Music Hall in Bradford this Thursday, October 25.